Sunaulo Parivar Nepal (SPN) is a well-established NGO delivering Family Planning and Sexual Reproductive Health services through-out the country via centres, mobile outreach teams to remote areas and social marketing. It works in partnership with Marie Stopes International UK (MSI), a global social business providing reproductive health services across the world with a mission of ensuring individual's fundamental right to have children by choice not chance. 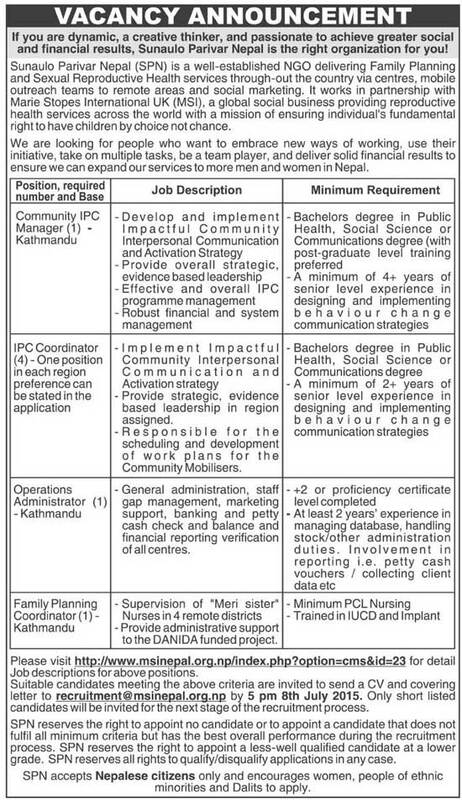 We are looking for people who want to embrace new ways of working, use their initiative, take on multiple tasks, be a team player, and deliver solid financial results to ensure we can expand our services to more men and women in Nepal.